The Kentucky Department of Agriculture (KDA) continues to facilitate conversations about local honey with the Kentucky State Beekeepers Association (KSBA). 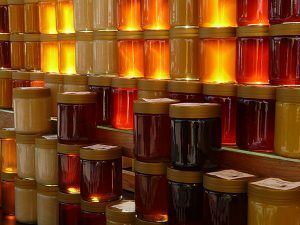 The KDA hosted a meeting Aug. 22 for KSBA and honey stakeholders at the Kentucky State Fair, where beekeepers and honey producers across the state discussed results from an industry survey and the possibility of a KSBA-certified Kentucky honey label. With a low survey response rate, those attending the meeting attempted to draw some broad inferences about the industry. Most of the responses revealed misconceptions concerning the use of the Kentucky Proud label. KDA Chief of Staff Keith Rogers opened up the discussion about potential solutions KDA and KSBA could develop together. Incoming KSBA president Jake Osborne expressed support for KSBA to develop its own certified Kentucky honey label after meeting with state beekeepers to discuss the possibility of pursuing grant opportunities from the Kentucky Agricultural Development Board. Additionally, KDA leadership conveyed that the Department is committed to working with the KSBA to find a solution that works for their organization. The Department is currently reviewing ways it could support a KSBA-certified Kentucky honey label. Those in attendance included KSBA members and officers Rick Sutton, Jake Osborne, José Olivencia, Joel Gonia, Jack Kuhn, Ross McFadden, Shannon Trimboli, National Agricultural Statistics Service officer Dan Palermo, and KDA representatives Keith Rogers, Tammy Horn Potter, Melanie Blandford, Chad Smith, and Sean Southard.